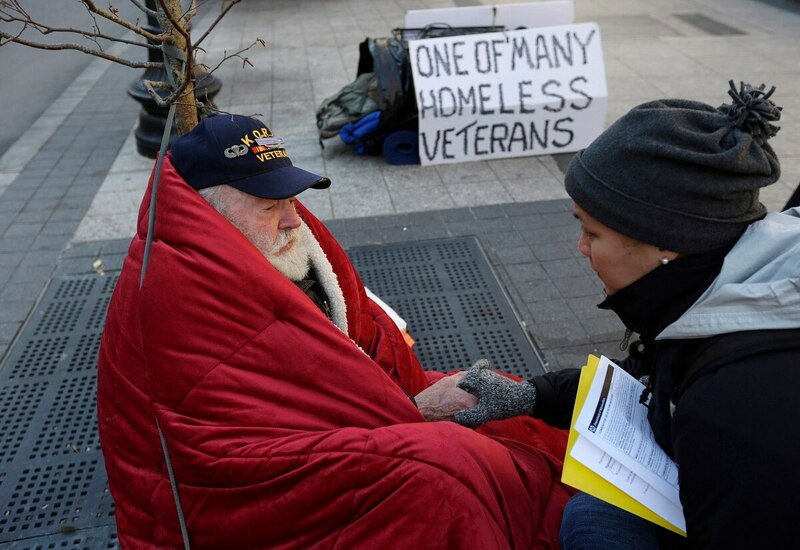 WASHINGTON — Los Angeles County officials saw a sharp drop in the number of homeless veterans during their annual survey earlier this year, good news that experts hope indicates the nationwide number of veterans battling housing problems is back on the decline. The announcement came at this week’s National Coalition for Homeless Veterans conference, where hundreds of veterans advocates from across the country, including the California county, gathered to collaborate on ways to better assist homeless veterans. According to federal statistics, the nationwide number of veterans without stable housing dropped from nearly 74,000 in 2010 to just above 40,000 in 2016, with significant decreases each year in between. But in 2017, the figure rose slightly — about 1.5 percent — largely due to housing cost issues in California. Earlier this week, Housing and Urban Development Secretary Ben Carson said without the increase in that state, the nationwide totals would have decreased for a seventh consecutive year. But Ben Carson said setbacks in 2017 don't mean government-wide efforts to help homeless veterans have failed or stalled. The 2018 estimate for the nation’s homeless population won’t be released until later this year. But on Thursday, officials from the Los Angeles Homeless Services Authority told the conference crowd that their preliminary estimates found an 18 percent decline in veteran homelessness in their county. In a statement, local organizers called it a positive sign for their region and the nation as a whole. “While there is still more work to do, the decrease signals that our strategies are working, bringing us a little bit closer to ending veteran homelessness in Los Angeles,” said Ann Brown, director at VA Greater Los Angeles Healthcare System. Homeless advocates across the country have said that rising housing expenses have made assisting distressed veterans more difficult in recent years, especially in high-cost areas like Los Angeles. Regional officials credited some of the recent success to work with VA’s National Homeless Program Office in overhauling their program operations and hiring of additional staff. More than 2,100 veterans in the California county were placed into permanent housing in 2017 and more than 13,000 others received some housing assistance. Officials are hopeful the full 2018 report will show even more progress. Conference organizers spent much of the week emphasizing positive news to counter the disappointment of last year’s estimate increase. The Los Angeles results received a loud ovation at the conference’s final day on Friday.